The 5 Browns performing –in 5 pianos– the 18th Variation from Rhapsody on a Theme by Paganini. The 5 Browns – brothers/sisters Ryan, Melody, Gregory, Deondra and Desirae – all attended New York’s Juilliard School. 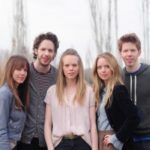 In fact, they became the first family of five siblings ever accepted simultaneously. The quintet enjoyed their first wave of critical attention in February 2002 when People magazine dubbed them the “Fab Five” at about the same time they were featured on Oprah and 60 Minutes. The quintet has garnered extensive coverage from media outlets ranging from The Tonight Show with Jay Leno, Good Morning America, Today, and The View to The Martha Stewart Show, Public Radio’s Performance Today, as well as The New York Times, Parade, People, the Los Angeles Times, the Sunday London Telegraph and Entertainment Weekly who called them “…five young Mormons who all play scorching piano. The 5 Browns tour extensively and have performed in numerous venues including the Grand National Theater in China and Suntory Hall in Japan. 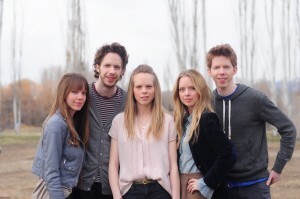 In addition to touring, The 5 Browns are published writers. Their book, Life Between the Keys, a lighthearted collection of personal stories, was published by Phoenix Books in March 2009. This article originally appeared on Transcend Media Service (TMS) on 25 Jul 2016. Anticopyright: Editorials and articles originated on TMS may be freely reprinted, disseminated, translated and used as background material, provided an acknowledgement and link to the source, TMS: Rhapsody on a Theme by Paganini (Music Video of the Week), is included. Thank you. Who is the performer? Why is she not acknowledged? Maria Pia, thanks for asking. I have strong reason to believe you did not watch the performance, or you would have seen that it is not 1 but 5 pianists in need of introduction. Duly added, therefore. I strongly suggest you watch this beautiful piece of classical music turned pop–somewhat–by the virtuosi siblings.